After spending RM40,000 - RM80,000+, there is still NO guarantee of being hired! Now, you are coached to be in "The Top 10% List of The Most Hirable Graduates" , and beat the competition of 600,000 UNEMPLOYED Graduates. ● Beat the Employers' Assessment Center. ● Apply Tools in answering tough interview questions. ● Create an attractive RESUME. ● What you should or should not put in your Resume. ● Big mistakes made in your: first career choice, first car, debts, and finance planning. ● What Asia 500 Employer Brands are looking for in the right graduates. ● Know your legal rights. ● Ask for Insights in the Q &A Expert Forum for your most pressing questions. ChangeU surveys have shown that 82% graduates did not get their preferred job in their first or second job. Career Insider Certification will increase your first ideal career opportunities by 8 times. Bits is a totally unique, new approach to hiring TOP 10% Interns & Management Trainees from AU, CN, EU, FR, HK, ID, IN, JP, KR, MY, PH, RU, SG, UK & US. Bits’ purpose is to match ChangeU ASIA 500 Employer Brands with TOP Graduates from the Best Universities. Bits offers OVERSEAS placements in Hong Kong, Singapore, China, Malaysia, Maldives & Philippines. 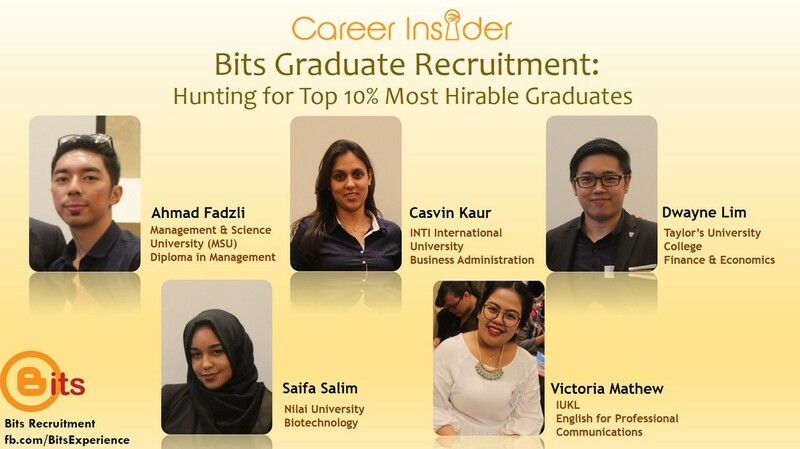 Bits recruits High Potential Graduates on behalf of ChangeU ASIA 500 Employer Brands & Fortune 500 MNCs such as Cathay Pacific, Hong Kong Jockey Club, Public Bank, Berjaya, Hong Leong, DRB-Hicom, Honda, TM, Naza, and MSC. Bits Graduate Recruitment is a ChangeU Brand which was established since 1990. "Don't pick a job. Pick a boss. Your first boss is the biggest factor in your career success. A boss who doesn't trust you won't give you opportunities to grow." ​"If you have no image branding, you have to chase after good jobs or customers. organized by ChangeU as your mentors, recruiters, and decision-makers will chase after you." ● Establish credibility and rapport with your audience. ● Communicate information clearly to your audience. ● Persuade and influence your audience. ● Develop the introduction and conclusion of the presentation. ● Apply the various visual aids & media choices for presentation. ● Use effective verbal and non-verbal techniques when making a presentation. ● Reduce stress when making a presentation. ● Gain feedback from peers and the trainer that will identify strengths and areas for improvement.